Lee Ray Robinson is the proud father of his four-year-old daughter Leeah Janea Robinson. Since Leeah is the pride and joy of his life, Lee has been taking Fatherhood P.R.I.D.E. 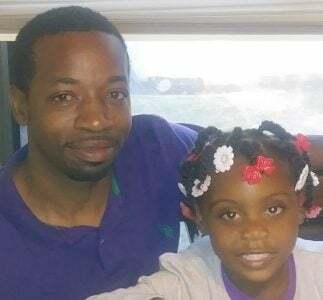 classes and attending workshops on parenting and financial literacy to better his fatherhood skills and enhance time spent with his daughter. A: Hearing Leeah say “daddy” after learning how to talk, teaching her how to spell, write and say her name and guiding her with acknowledging who she is as a person and a future queen. A: I’ve had some financial and living setbacks, but with the help of family, Fatherhood P.R.I.D.E. and my trust in God, I’m able to see the light at the end of the tunnel. Q: What advice would you give to dads like yourself? A: Do not give up. It is going to be hard, but you are working towards a goal to help yourself become a better parent for your child. Q: What is your favorite activity to do with Leeah? A: 1) Going to the park, bike riding and just sharing the little things in life. 2) Going to church together – I want to instill in her the same strong foundation that I received as a child and teach her that she is beautiful and strong and that with God in her life she can accomplish anything.